Hello just wanting to share some of my Maybelle inspired modern calligraphy. Has anyone in the forum taken her workshops? She lives in California, but travels all over the world to teach. Tristan B. at besottedblog.com has an interview just posted on her yesterday. It's worth checking out. She gives you the scoop on her favourite holder and nib! Martha Stewart discovered her 10 years ago and the rest is history. 9 Likes Erica McPhee, Nickkih, dragonflydreamer, Lynn Lantz, Faeleia and 4 more people like this. I took her workshop just this past August at Poketo in Los angeles. Hello Roseann, How did you find her workshop? I was hoping to get one of her calligraphy kits through her Etsy store. Do you think it's worth the price? I don't have a copy of her exemplar. It's one I'd like to have. Does she cover a lot in her workshops? Let me know your experience. If I lived in San Francisco I'd take her class. Thanks! Hi...my very first calligraphy class was one on Maybelle's workshops. We were lucky enough to have her come to my place of work and teach a private class for 8 employees! She is amazing! Her work is beautiful, she is delightful and she gave everyone a great deal of personal time. Plus her kit is awesome....it comes in a lovely rustic wood box that her husband built! It was filled with nib holder and nib, black and white inks, exemplar, a dinky dip that was personalized, and a few other goodies! I can't speak highly enough about her workshop...if you ever have a chance to take a class from Maybelle...jump on it! I know she travels quite a bit to teach, I'm sure her website has a listing. 1 Like Marilou Marshall likes this. Just found some photos of the goodies that Maybelle gave all the students in her workshop! 6 Likes Lori M, Marilou Marshall, Lynn Lantz, Joel, Mandy and 1 more people like this. Thank you so much for posting these lovely photos. I'm so happy that you got to learn from Maybelle. I'm from Canada, maybe one day she'll come to visit. Lovely photos. Made my day!!! 2 Likes Marilou Marshall and Faeleia like this. I purchased Maybelle's Calligraphy kit "Workshop in a Box" and love it!! It's one of those rare purchases that happily exceeds expectations. 2 Likes Marilou Marshall and lisanjones like this. I ordered her set on ETSY, I adore her and her work! Thank you for these lovely photos! I took Maybelle’s class last month here in Singapore! She is so sweet, and offers help when you struggle, and has such beautiful calligraphy style. I've been a fan for ages. I’d say it’s better to catch an in-person workshop, but I’m sure her kit on Etsy is still very much worth it. Just took Maybelle's class today as my first in-person calligraphy class ever and it was very fun! The class was suited to complete beginners so you probably get the most out of it if you are just starting out, or aren't a professional. She covered basic supplies, showed us how to do warm-up exercises, write the alphabet with black ink, and troubleshoot white ink. She was very approachable and enthusiastic, a great cheerleader and gave attention to everyone who needed it. 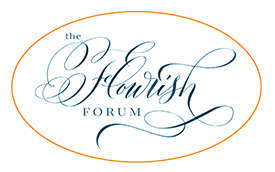 Erica - I recommended The Flourish Forum to my classmates as a great go-to for resources, especially your Pointed Pen tutorials! Hi! My name is Sienne (Si-yen/ Shen). She's coming to Singapore too!? Wow go pat!! Singapore represent! I took her class last Spring in SF. It was a combination of floral arranging and calligraphy and was really wonderful. As others have said, she is super sweet. We spent half the time learning her hand, practicing the names of flowers, and the other half making flower arrangements with Kiana Underwood, aka Tulipina. It was held in a photo studio with huge windows, lots of light and a view of the Bay Bridge. Her husband makes the wood ink holders and boxes! A super delightful day, the class was called Petals and Penmanship. I'm taking her online workshop through Creative Bug right now. I find that even through a video she's a fantastic teacher. i hope to take an actual class in person with her some day!